Indeed we have accord on 'who knows' which was the motivation for challenging the fact-free assertions that insist R U106 in Ireland arrived later and as a consequence of English linked colonizations. It is entirely reasonable, to suppose it entered along with other Haplogroups, equally credible are the observations on this matter by Tim Janzen. Otherwise we are left with a homogenous early migration into Ireland, a most unlikely scenario. Clearly you have a position on this which runs counter to such reasoning, I only hope your value of truthful inquiry is not unduly stunted or obscured by any particular interpretation. Hopefully you would agree it's better to keep an open mind on the issue, and my presence here is not about affirming a personal belief but to simply question the 'Germanic' orthodoxy concerning R U106, and that Haplogroup's presence in Ireland. What I wrote are neither assertions nor "fact free". The distribution of U106 in Europe as a whole and in Ireland are facts, as is the history of Ireland, which includes relatively recent invasions and settlements by U106-rich populations. Likewise a fact is the scarcity of old Catholic, Gaelic surnames among U106+ men identifying an ancestor born in Ireland as mdka. You are still claiming Tim Janzen said that U106 variance in Ireland is "high". You have yet to produce any proof of that. Let's suppose for a moment that he did say that. Did he cull out the English and Lowland Scots surnames when he calculated "Irish" U106 variance? If he did that, would there be enough U106 left in Ireland to get an accurate reading of the variance? have really thought hard into this and am a bit of a skeptic that U106in England is all or almost totally down to historic period Germanic settlement. In fact I have tended to probe the logic of people who argue it. However, I recently had a deeper think about it and archaeological evidence and this led me to doubting U106 could have been associated with the beaker period. Put simply, U106 west of the Elbe is up to 40% lower in variance than in eastern Europe (Poland etc). Now combine that with the estimate that U106 is only 4-5000 years old (probably more like 4000) then that would make U106 in the countries west of Poland only perhaps 3000 years old or so i.e. late Bronze Age. That includes both the continent and England. That of course is the upper age. Add to this that the fact that the predominant links of England in the post-beaker early-later Bronze Age were with the area across the channel on the west of the Rhine then I dont see a scenario for major movement of U106 to England. However, I wouldnt rule out the odd U106 reaching England in the Bronze Age due to direct contact between the east of Britain and the area east of the Rhine. In the Iron Age I suspect from present distribution in terms of the Flemish-French division in Belgium that U106 was not common among the Belgae. Indeed, English Belgic links seem very much to be with the western end of the Belgae. Overall from being very open to the idea that U106 could have been in England in some numbers due to the beaker connections, the apparent post-beaker date of U106 in the west has seriously diminished this possible avenue. Overall I suspect that U106 was very minor indeed in England in prehistory although trade links beyond the Rhine mean its not impossible that there was a small amount. As for Ireland, the relatively late variance derived date for U106 west of Poland (and of course in Britain) does limit the scenarios of it reaching a country as far west as Ireland in the prehistoric period. Overall the variance dating of U106 west of Poland does kind of support the traditionalist model linking it with a late spread west at the end of the Bronze Age that has been linked to the spread of Germanic in the Jarstoft and Harpstedt cultures that succeeded the Nordic Bronze age and the intermediate cultures in Holland east of the Rhine. Finally as for the pre-Germanic origins for individual Irish (or any U106), is the best way of estimating this not individual matching. A prehistoric Irish U106 should probably not have matches in England or Europe more recent that 2000 years or so. Appreciate the input Alan, you raise some very interesting points. As to the comments of our fellow contributor, firstly, can we establish some fact concerning so-called 'Burden of Proof' as it is being pressed in this exchange, which is actually a somewhat fallacious line of argument. I say that because you are choosing to place the burden of proof on the wrong side, in addition you are using a fallacy in interpreting a lack of evidence for 'side A' as constituting 'evidence' for 'side B' in a case where the burden of proof actually rests on 'side B'. A common name for this is an Appeal to Ignorance. This sort of reasoning typically has the following form: Claim X is presented by side A and the burden of proof actually rests on side B. Side B claims that X is false because there is no proof for X. As I mentioned a simple search on the Internet will son reveal what Tim Janzen observed with respect to the variance of R U106 in Ireland and the probable early arrival of that Haplogroup. I am not sure it assists our exchanges to respond to what are essentially 'straw man arguments' suffice to say that there is no empirical evidence that Ireland's R U106 population owes its origins to later English colonization, nor can it be asserted with any authority or proof that such invasions and settlements, were as you assert (another fact-free claim) "U106-rich populations"
Clearly there's a process of denial operating, evidenced by the unwillingness to accept the very reasonable scenario that R U106, along with other Haplogroups, arrived in Ireland as an admixture, to establish lines that may well indeed have given birth to the very variance which Tim was looking at. It was pointed out that the differences that Tim was talking about were too small to be able to draw conclusions from and that there were no sigmas involved in the calculations. The conversation didn't last very long and everybody including Tim started talking about Italy afterwards, personally I don't get the impression that he had much conviction in this calculation and I'm not aware that he repeated it elsewhere. As far as I know nobody has identified an Irish U106 cluster which you would expect if it had survived there for the last 3-4000 yrs, especially given the extensive testing of that country. It seems likely to me that Irish U106 had multiple very small scale sources - perhaps including late prehistoric (although I am not convinced), a tiny drop of Anglo-Saxon, Viking, Norman and later. That sort of scenario of a small group composed of a number of diverse very minor inputs could lead to raised variance. I dont know a huge amount about U106 in Ireland though. What is the subclade situation and what are the age of the Irish U106 folks closest matches. The latter should tell us something. Its extremely unlikely that a prehistoric Irish U106 should have matches in Britain or the continent on their FTDNA homepage if they have been in situ since prehistoric times. I think the likelihood of a continental match of an Irish U106 being down to wild geese etc is incredibly low considering how few Irish U106 there are. Indeed, Tim Janzen did offer those findings, which no doubt was not welcome by those who subscribe to the all R U106 is 'Germanic' ideology. Until such time as Tim formally repudiates the results he determined on the high variance of R U106 in Ireland, and its meaning in terms of that Haplogroup's arrival there, it is perhaps wise not to try to undermine or discredit his conclusions by any subjective impression that he may not regard them as valid. Unless Tim Janzen now regards his results as misleading, flawed or of insufficient detail we must presume they remain as they are, learned and authoritative findings that raise important considerations relating to R U106 and its early migration to Ireland. In light of the accepted age of R U106 Tim's results and observations require us to consider if it settled in Ireland before the rise of of Germanic culture. That being the case, and there's no logical reason why it could not have entered Ireland as part of an ancient admixture, the question is did it survive? As far as I understand, given that a measurement of variance is tested using living people, then its difficult to know how the original R U106 settlers could not have survived, had such perished they wouldn't have the descendants to furnish the data which Time presumably used in his calculations assessing the Haplogroup's variance in Ireland. As to the current frequency of the Haplogroup in Ireland presumably that percentage has changed over time according to various demographic dynamics most notably I wonder if, or to what degree, the Famine, with the loss of over a million, distorted or reduced the frequency of Irish R U106 Haplogroup. Moreover, given the numbers of people in Ireland who have been tested, which I imagine is a fairly small percentage of the actual population, can we conclude with absolute certainty that the current figures are entirely or accurately representative? Could it be that there exists a pool of R U106 as yet untested in Ireland? Unless Tim Janzen now regards his results as misleading, flawed or of insufficient detail we must presume they remain as they are, learned and authoritative findings that raise important considerations relating to R U106 and its early migration to Ireland. I don't see why, if people weren’t allowed to questions things after one authoritative figure made a statement research into quantum physics would have been held up for years. A simple case in point with respect to Tim's variance calculation. We have a brickwalled American in the Z18 project, he has an Irish name and has put Ireland down as his ancestral origin, however he's part of a cluster that is demonstrably 'Germanic'. I'm not going to turn round and tell him that he's wrong about his ancestry, in fact he quite likely isn't but his line couldn't have been in Ireland close to the beginning of U106 (apart from anything else the cluster isn't old enough) he would have been one of people used in Tim's variance calculation though. The facts remain what they are. Once again, did Tim Janzen first remove those with English and Lowland Scots surnames when calculating "Irish" variance? I don't think so. If he did, would enough U106 haplotypes remain to actually calculate variance? Remember too that variance represents the upper limit of the age of a haplogroup in an area. It says the haplogroup could not be any older than that there but that it could be much younger. If whoknows Boylan wishes to believe he is descended in his y-dna line from a very ancient Irishman, let him. Apparently it is a matter of some pressing importance to him. This is, I believe, the third or fourth dna chat forum where he has pressed his case, despite the preponderance of the evidence that weighs against him so heavily. As I mentioned on another thread, perhaps we should calculate the variance of North American R1b in order to pave the way for those of us who are brickwalled in West Virginia to claim aboriginal North American status. Agreed the fact remains that Tim Janzen did indeed conclude that the variance of R U106 in Ireland as being high, not only so but higher than continental Europe, moreover his findings, as I mentioned, considered that it may well have arrived in Ireland fairly quickly after its initial emergence, which would have been long before Germanic became an established culture. So the questions, posted previously remain. Again, the facts are that a respected academic and researcher worked with the available data on R U106 in Ireland and reached the above conclusions, that may well be difficult and inconvenient medicine to consume for those who worship at the altar of R U106 is 'Germanic', but so be it. By all means question, however your original comments simply asserted an 'impression' you felt, which had no basis in fact or more saliently addressed Tim's findings on the subject. As to the shortcomings of particular data, while your preferred example is noted, in relation to the veracity, accuracy and reliability of Tim's findings, any critical evaluation worthy of consideration would need to be a meticulous appraisal of the same set of information as used by Tim Janzen. For the purposes of the present discussion it would be extremely helpful if perhaps you could assemble such an assessment, and present an objective critique, it would be an interesting read and challenging too, given the experience, knowledge and insights Tim Janzen within the field. I would read any such paper with an open mind, until such time I continue have the highest respect for Tim's research and findings, his thoughts on R U106 variance in Ireland remain a highly informed and learned counter-balance to the mind-set which insists on peddling the orthodoxy of R U106 as 'Germanic'. As to the shortcomings of particular data, while you preferred example is noted, in relation to the veracity, accuracy and reliability of Tim's findings, any critical evaluation worthy of consideration would need to be a meticulous appraisal of the same set of information as used by Tim. Tim Janzen has not endorsed your opinions. As I said before, variance calculations do not give the actual age of a haplogroup in a region, they simply give an upper limit beyond which the haplogroup could be no older there (barring something extraordinary, like a bottleneck). It could certainly be a whole lot younger. Given English, Scottish, Flemish, German, and Scandinavian U106 input into Ireland, if the variance seems high, it is undoubtedly artificially inflated due to the different and varied outside sources of U106 there. North American R1b variance would probably show something similar. Will you argue for some very ancient R1b clans in North America? As I mentioned before, I seriously doubt that Tim Janzen excised the English, Scottish and other non-Irish surnames from his list of "Irish" U106 before calculating its variance. If he failed to do that, then any such variance result is highly suspect. In fact, it would be invalid for the purpose for which you are employing it, i.e., as your sole argument for the antiquity of U106 in Ireland. No one stated that Tim had endorsed my position, that is a misrepresentation, we cannot maintain a balanced or meaningful communication by distorting the comments of those with which we exchange. What was stated was Tim's findings on the high degree of variance within R U106 in Ireland and his view that it may have arrived in Ireland quickly after its original emergence. Again at no stage did any assert that variance assessments provide "the actual age of a haplogroup in a region", what was clearly noted was what Tim Janzen actually reported that given the high degree of variance the Haplogroup may have entered Ireland at some early time following R U106 first appearing. As to the assertion relating to English, Scottish etc R U106 "input into Ireland" where is the measurable and definitive evidence for that bold comment? I know how much you value supporting statements with verifiable sources, could you kindly offer a credible reference which provides the recorded amount of 'English' R U106 that colonized Ireland? If such a source is not forthcoming readers will have to conclude that what you offered was in truth, a fact-free assertion. Regarding surnames they hardly constitute an empirical determinant in this subject, and I would advise you to contact Tim to clarify if he considered the measures you highlight. Meanwhile his findings remain. My comments here, while drawing upon an important and relevant finding made by a respected scholar, are not entirely structured on Tim's results. as any careful reading of what I stated reveals. 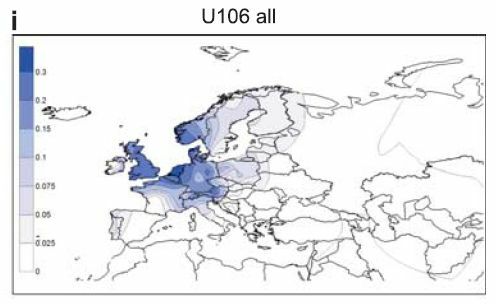 Even without such findings it is, on the basis of reason alone, highly likely that R U106 as part of an admixture traveled to Ireland during some early migration. To reject that probable scenario invites the question do you consider such migrations to composed of a homogenous body, one Haplogroup, any barring R U106? It is of course a nonsense and there is no reason whatsoever why early R U106 migrants should have stopped at the Channel and turned back from onward travel to Britain or Ireland. Here is a list of the surnames of those in the R1b-U106 Project listing Ireland as place of ancestral origin. I think the list pretty much speaks for itself, but I have bolded the surnames that appear to me to be Gaelic Irish or possibly Gaelic Irish in origin (I put a question mark after the ones that I have some reservations about). I count eight surnames that are possibly old, Gaelic Irish surnames, and a couple of those are somewhat doubtful. For the surname Nolan, there is a Nolan DNA Project. Most of those in it are L21+, including some who are M222+. Look at the results for yourself. The Cruwys, etc., DNA Project makes it clear that Cruise, etc., is a surname also found in England. That casts some doubt on its possible Gaelic origins. Anyway, it is pretty obvious that most of those who are U106+ in the R1b-U106 project who list Ireland as place of ancestral origin have surnames that are not Irish. By way of stark contrast, compare that list with the Ireland category at the R-L21 Plus Project. Could Tim Janzen have used just eight haplotypes to get his "Irish" variance calculations? I doubt that he would do that, which means he probably included a lot of the haplotypes of those with non-Irish surnames. No one misrepresented your position. No need to do that. It isn't likely that U106 entered Ireland very early in its existence. If it did, it's a remarkable coincidence that its bearers apparently chose to settle in precisely the same locations that much later U106 newcomers, like the Vikings, the English and Lowland Scots, chose to settle, so that U106 overall is scarce in Ireland but highest in frequency in those places. Don't be silly. Pick up any reputable book of Irish history. England, Scotland, Scandinavia, Germany, and Flanders all have much much higher frequencies of U106 than Ireland has, and all of them have contributed to the Irish population in the historical period. That is common knowledge. You may even know it, as well. Sure they do! If I propose to calculate Swedish haplotype diversity with an eye to something ancient, and I include recent Chinese immigrants, how accurate will my calculations be? Similarly, if I am looking for Irish U106 diversity but include the non-Irish, how accurate will my findings be? Yes, U106 could have gone to Ireland very very early indeed, were it in a position to do so. There is no reason to believe it did, however, given its current distribution in Ireland, its relative scarcity there, its especial scarcity among those with Irish surnames, and its distribution in Europe. There is some reason to doubt that U106 reached the Low Countries before the 3rd century BC. Its highest variance is in Poland. Its variance drops somewhat to the west, as Alan mentioned. U106 has a pretty obvious connection to Germanic-speaking peoples, and they probably did not arrive so far to the west and south until the 3rd century BC. Prior to that, the Low Countries were in Celtic hands. Even in England, where U106 levels are much much higher than in Ireland, U106 drops off as one moves north and west into the "Celtic Fringe", and L21 begins to predominate. There is no indication that U106 in the British Isles is in any way connected to Celtic-speaking peoples. Duff, Higgins, Lowry, Madden and Moore could also all be "Gaelic". McNeill is "gaelic" though it's origin in Ireland is usually tied to Gallowglasses from Western Isles of Scotland. de CRÚIS—XI—de Cruce, de Crosse, Cruice, Cruise, Cross; Norman 'de Grays,' Latin 'de Cruce,' i.e., of the cross, from residence by the roadside or market cross (Middle English crouche, cruche); the name of an Anglo-Norman family who came to Ireland at the time of the invasion and obtained lands in Dublin and Meath. The chief seat of the family was at the Naul, where the ruins of their castle are still to be seen. In 1653, Peter Cruise of the Naul was transplanted to Connacht, and in 1691 many of the name were attainted. There was also an old family of Cruises in Co. Clare. Angliscation of names can be classed via the following processes. Translation/assimilaiton/substitution can result in "Gaelic" names matching english names. for example "Mac Conraoi" is anglisced as either Conroy (1) or King (2), thence the reason King is quite a common surname in west of Ireland. It's a result of direct translation of Mac Conraoi. That is one of the difficulties with some Irish surnames. They might be Irish; they might not. Your post itself is a testament to the pervasive historical period English influence there, which on the genetic side no doubt included an infusion of English y-dna. And of course a Norman surname is a Norman surname. I have McNeills in my family tree on my mother's side, but they came from Scotland. As a matter of fact, as I recall, one my relatives in that line tested I1. Perhaps more has been learned since then? I sent him an email. I've communicated with him by email in the past, although not recently. If he answers me, I'll try to find out if he included non-Irish surnames in his variance calculations and just what his current opinion is. Tim Janzen, as I have stated all along, assessed Irish R U106 and found it to be of a high variance and suggested on those grounds that it may have arrived in Ireland soon after the Haplogroup first emerged, that would as you know probably pre-date Germanic culture. As to the names in question, they offer no conclusive evidence to undermine with any authority the findings of Tim's researches. For example. leaving aside the minefield of Anglicized Irish names, some of which such as Smith having the alluring appeal of being indicative of 'English' roots are in fact crude renderings of Gaelic Sept names. Then again there was a practice by some in Ireland to either adopt or were given English sounding names, to in part lessen the prejudice and oppression that was doled out to those bearing Gaelic names. Such considerations, along with the often poorly recorded variants of Irish names in the various Hearth Rolls and other Census and we can see numerous instances where surnames have been transformed and or corrupted into a more English looking form. That reality makes a reliance on seemingly English surnames as evidence to question Tim Janzen's methodology and subsequent results. highly questionable,as such names may in truth mask a lineage whose origins were Gaelic Irish at some point. Nor should you so hastily conclude that an Anglicized Irish name having an equivalent in England is by default evidence of English settlement that is flawed reasoning, as there are a number of Irish names which although on translation into English have some similarity to names in England are in fact unrelated. However before concluding this happy diversion addressing your red herring, it should be noted that EVEN IF those names could be definitively proven as 'English' the case is still not conclusively demonstrated that they constitute proof that R U106 is by definition 'Germanic' as I mentioned previously the whole concept of Britain being swamped by waves of Germanic peoples is thankfully under serious revision. The model now given serious subscription is of a majority British population dominated by Germanic military, political and possibly economic elite, with some Germanic settlement, but not on the scale hat displaced the British 'Celts'. That being so it raises the question if R U106 had in fact arrived in Britain prior to such 'Dark Age' invasions to establish what would become a fairly significant percentage of the British population. Is R U106 not over 20% of the British population? If so what amount of that considerable figure may be descended from very early migration as opposed top the mythological flood of Germanics into Britain? On that basis what few of those 'English' names on that list that are genuinely demonstrably of English origin whose ancestors may have 'settled' in Ireland may well have not derived from some Angle, Jute or Frisian ancestry at all but may have been from a R U106 lineage that could have entered Britain before the establishment of such Germanic cultures. Herein lies the reality we simply do not know, what we have is a scale of probability and within that it is as equally possible that R U106 reached Britain and Ireland as a result of some ancient migration/s. Your interpretation of surnames does not invalidate that likely-hood and is as I hope has been shown, limited in terms of reliable evidence and inherently flawed. If Tim Janzen included the haplotypes of those with non-Irish surnames in his calculations, then what he got was something other than Irish variance. He got some Irish variance plus some English, Scots, etc., variance. And that does make a difference. Some Gaelic surnames have been anglicized, it's true, but it is generally known what those are. It is also known that many non-Irish settled in Ireland in the historical period. No doubt some of them adopted Gaelic surnames or fathered children who, despite their non-native y-dna, received Gaelic surnames. However before concluding this happy diversion addressing your red herring, it should be noted that EVEN IF those names could be definitively proven as 'English' the case is still not conclusively demonstrated that they constitute proof that R U106 is by definition 'Germanic' as I mentioned previously the whole concept of Britain being swamped by waves of Germanic peoples is thankfully under serious revision. The model now given serious subscription is of a majority British population dominated by Germanic military, political and possibly economic elite, with some Germanic settlement, but not on the scale hat displaced the British 'Celts'. That being so it raises the question if R U106 had in fact arrived in Britain prior to such 'Dark Age' invasions to establish what would become a fairly significant percentage of the British population. Is R U106 not over 20% of the British population? If so what amount of that significant figure may be descended from very early migration as opposed top the mythological flood of Germanics into Britain? On that basis what few of those 'English' names on hat list that are genuinely demonstrably of English origin whose ancestors may have 'settled' in Ireland may well have not derived from some Angle, Jute or Frisian ancestry at all but may have been from a R U106 lineage that could have entered Britain before the establishment of such Germanic cultures. It does if Tim Janzen included non-Irish surnames in his variance calculations, but enough of that. It isn't likely that there was much if any U106 in Britain prior to the Roman Period. As it is, U106 is most frequent in the south and east and drops off, as I mentioned before, as one moves north and west into the "Celtic Fringe", where L21 predominates. Once again, there is no indication that U106 is connected in any way to Celtic-speaking peoples in Britain. And it is obvious to any unbiased observer that there is a clear connection between u106 and Germanic-speaking peoples. That doesn't mean there aren't or never were non-German U106, but, just the same, the connection is plain as day. That is why it is constantly being remarked upon and why I am not the first, nor will I be the last, to point it out to you. I know from talking to friends of mine in the R1b-U106 Project that there was at least one Irish U106+ guy who quit that project because they told him the same things I am telling you. Apparently, like you, he strongly disagreed with the consensus opinion, which is the opinion held by those who run the R1b-U106 Project and who study U106 constantly. It doesn't really matter all that much to me. Again I shall ignore the appeals to ridiucule as they are unworthy of attention. What is entirely reasonable is that neither yourself or I know with any certainty, as I mentioned in the beginning we are in an arena of speculation, not empirical evidence, that you choose to follow an orthodoxy on the subject is your right, it does not though invest the dogma that insists that R U106 is Germanic with any infallibility or universal truth. It is very probable that R U106 arrived in Britain and Ireland at an early stage, and the evaluation of current frequency and distribution, is no definitive evidence to convince hat such a migration could not have occurred. We also have the subject of variance too, which as I have mentioned is regarded by some as being more reliable an indicator of origins and early migrations. That's why Tim Janzen's findings are of such relevance to this matter. I have made clear the concerns and shortcomings concerning your somewhat selective interpretation of Irish names, so shall not go over that ground, fellow visitors to the forum can reach their own views on what has been stated. What you can offer is what all of us are limited to, namely opinion, no mater how many subscribe to a particular line of thinking in this subject, it remains just that a view, informed maybe, reasoned sometimes yet always never able to be proved with the certainty of scientific fact. That's the key point missed by those who line up to swear allegiance to the orthodoxy of R UI106 is 'Germanic', while it may have current frequency peaks in Austria or the Netherlands that does not make it originally 'Germanic', nor unable to migrate westwards to Britain or Ireland before such cultures emerged. Let me make something plain I am not engaging in this discussion to press any personal claim in terms of ethnology, so please refrain from misunderstanding my motive, which is in essence to offer a different, yet equally valid line of speculation, in which R U106, like other Haplogroups, migrated at an early stage, and in all likely hood may well have settled in Britain and or Ireland. It may be an unpalatable consideration, which clearly appears the case, yet it's far better to keep an open mind on the subject than indulge in an interpretive denial built upon a seriously flawed assumption. As to your ever so generous offer I have no interest in proving Irish origins, simply sowing seeds and exposing a dogma. Those with time to kill can read this thread and make up their own minds. I do want to pay you a compliment, however. If you are Mr. Boylan, and I suspect you are, you have done very well this time in restraining your emotions, which in the past have gotten the better of you. Congratulations. The existence of R-U106 as a major lineage within the Germanic group is self-evident, as Germanic populations have a higher frequency against all their neighbors (Romance, Irish, Slavs, Finns). Indeed, highest frequencies are attained in the Germanic countries, followed by countries where Germanic speakers are known to have settled in large numbers but to have ultimately been absorbed or fled (such as Ireland, north Italy, and the lands of the Austro-Hungarian empire). South Italy, the Balkans, and West Asia are areas of the world where no Germanic settlement of any importance is attested, and correspondingly R-U106 shrinks to near-zero. I'm U106 with mostly Irish, Cornish, Welsh and Highlander ancestry. I really have no wolfhound in this "fight". The only way I can comprehend P312 being so dominant in the ancient Isles vis-a-vis its coeval M269 brother U106, is that the vast majority of U106 was holed up NE of the Elbe for a long time. I think the high frequency of U106 in the Low Countries is very misleading. If U106 was in the Low Countries during the Iron Age then I see no reason why a good proportion of U106 in Britain can't be ancient. But as it happens, the freq distribution of U106 in England very closely matches 5th to 11th Century Angle and Saxon kingdoms. P312 seems to have gotten first mover advantage in the fertile western European lands and expanded S-N down to Spain and up to Norway (the Atlantic mob). U106 hugged the Black Sea then pushed NW along the South Baltic. When it got to the Elbe it struggled to gain much of a foothold west of it. P312 was already there. Magna Germania probably sees some U106 spillage SW of the Elbe with Rome having softened up Gauls. I don't even see the Belgae having much if any U106 at all. Despite thorough Frankish incursions into present France, frankly the modern U106 distribution in France doesn't say much for the U106 these "Germanic" peoples apparently brought with them, more likely they brought more P312 than anything else. "Germanic" is such a nebulous term. And frankly it really only applied to one or two small tribes near the Rhine in Caesar's time and those Germani were probably Celtic. Low U106 freq in France fits with U106 being confined mostly to north of the Elbe and the Baltic shores in ancient times.